Focus on the ideas and thoughts of the original Greek New Testament writers rather than getting caught up in parsings and morphologies. 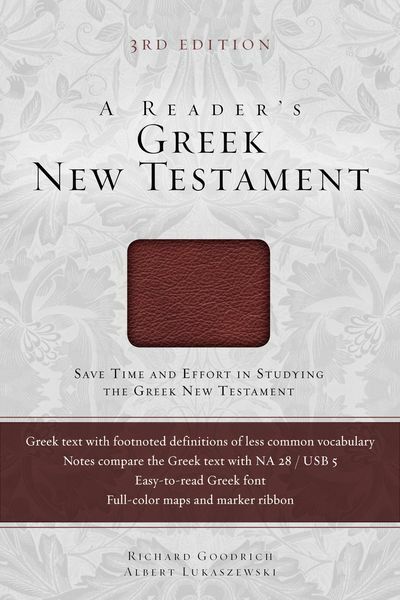 A Reader’s Greek New Testament: Third Edition is an invaluable tool that promotes reading for comprehension, decreasing your reliance on lexicons and dictionaries by providing easy gloss access to only the most rarely occurring words. A Reader’s Greek New Testament: Third Edition is a practical and surprisingly affordable resource. Based on the eclectic Greek text underlying the New International Version, this Greek New Testament provides footnotes comparing the text with the critical text of UBS5/NA28. This resource also comes with full-color maps. Definitions of all words occurring 30 times or less are a tap away. Quickly access related Greek dictionary entries from your Olive Tree library, or perform an instant search to see other uses of the lemma in the Greek New Testament text. Gloss references can be opened in the split window in parallel mode, allowing read-along contextual access. Access to footnotes comparing the Greek text of the NIV with the critical text of the UBS5/NA28 are a tap away. Lexicon of Common Greek Words (defined as those occurring more than 30 times in the NT text) are available by setting the Verse Chooser to List View.